Upright Rows: An easy exercise to get completely wrong! You really have to watch your form here. In THT training I recommend hitting the traps with a couple of ‘direct stimulation’ sets. This is because the traps come into play so much with your shoulder and back days that they don’t need a lot of direct action. One great way of getting the job done (and the one I am currently using) is with upright rows. The danger here is in using the shoulders more than the traps themselves. I have a few little tricks that ensure I’m really hitting the traps primarily. (apologies: I look terrible in the vid. This is because I felt like heck when it was recorded. I had hardly eaten anything for a couple of days due to a short period of sickness – I was SO gutted, I haven’t been sick in years!). (1) It’s best to lift the bar from a racked position, rather than off the floor. In fact, you should bear this in mind for all your standing barbell lifts. The reason is simple: you want to preserve as much energy and strength for the working set as possible. (2) Do a comfort test first! For upright rows, we use a narrow grip. However, how narrow depends on your own structure. 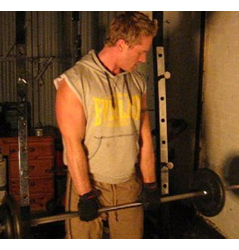 Take a barbell with no loaded weight and grab it with a ‘narrower-than-shoulder-width’ grip. Now raise it so that the bar is in line with the bottom of your neck. How do your wrists feel at this point in the movement? If you’re not comfortable, you can expect an actual weighted set to feel much worse. Experiment with (slightly) wider and narrower grips to find where you feel most comfortable at the top of the rep.
(3) Now you’re all set. Take the bar and let the weight ‘hang‘ on your arms, don’t bend at the elbows or allow the upper arms to take the weight. Allow your torso to fall a little forward. At this point ‘engage’ the traps. By this I mean allow your arms to become like ‘dead weight.’ Relax the arm muscles momentarily and you should feel the load really engaging the traps. I came up with this manoeuvre myself out of sheer frustration; I just couldn’t ‘feel’ upright rows at all before this. (4) Now, in a smooth fashion, start raising the bar. Initiate the movement with the traps and once moving, allow the body to move back to an upright position. The top of the rep is when the bar is about neck level; you’ll naturally stop here anyway. (5) Now lower the bar slowly and under control of the traps. This is important; upright rows really demand a slow negative (lowering) aspect to get maximum trap stimulation. (6) Let the torso come forward to the starting position, again fully engaging the traps. When you start to use this form, you’ll really feel and see the difference in your trap development! Thanks for the advice on these, I did these yesterday and could feel me shoulders been worked too much, I wasn’t letting my torso fall forward so i’ll be sure to try this next week. Hey, that really works! I tried one set doing the engage thing and my traps were feeling it big time! I never did these because I couldn’t feel it on my traps but it’s a different ball game now. Traps are actually a bit sore already! Hey Mark, great advice on these. I was afraid that I was using too much of my arms but I’ll try these out and see how it goes. Loving the workout execution series! Thanks everyone. Glad the vids are helping you all workout more effectively. Hey Mark, when I do upright rows, I put my hands all the way together almost touching, but I still hit traps pretty well. I’m not trying to change the topic, but I saw in your most recent post that you were reading books on “monistic idealist interpretation of Quantum Mechanics”. What do you do for a living? @Tyler, do what feels most comfortable. Experiment with the other grips to make sure you aren’t robbing yourself of gains. I work for the government, a desk job. I’m just really interested in the quantum physics/consciousness connection. This post is very important for 2 reasons. I’ve been doing these with an EZ curl bar because it felt more comfortable on my wrists. I know the answer is always do what is most comfortable but I’m wondering if the angle of my wrists would shift more emphasis on my shoulders than my traps. I’ll have to try this out next week. Any chance of getting a one of these guides for the barbell rows? This seems to be the one exercise I can never tell if I’m doing right. I tried this, but I didn’t feel my traps at all..how far up are you supposed to lean your torso? What do you mean Karan? At the top of the movement? Torso should be pretty much straight at the top. 2 tips – Try a narrower hand width and make sure traps take the weight fully at the bottom of the rep, relax the arms to make this happen. I mean like I took the barbell and put the weights on it and what not and then when I lifted it I tried doing what you did here and I didn’t really feel my traps – I fell more of my triceps and shoulders. I think I may have been too concerned with how far in to lean my torso at the negative part of the movement.. Thanks in advance and thanks for this site! It feels like my grip gives out before i can do as many as I should. As an alternative would bent over dumbell rows be just as good? @Pawel – do shrugs instead, nice and smooth and under full muscular control. What’s your take on upright rows being described as a contraindicated exercise for the shoulders? @Alex. I think each person needs to assess this for themselves. I personally switched to shrugs and find them safer and more effective at directly stimulating the traps.